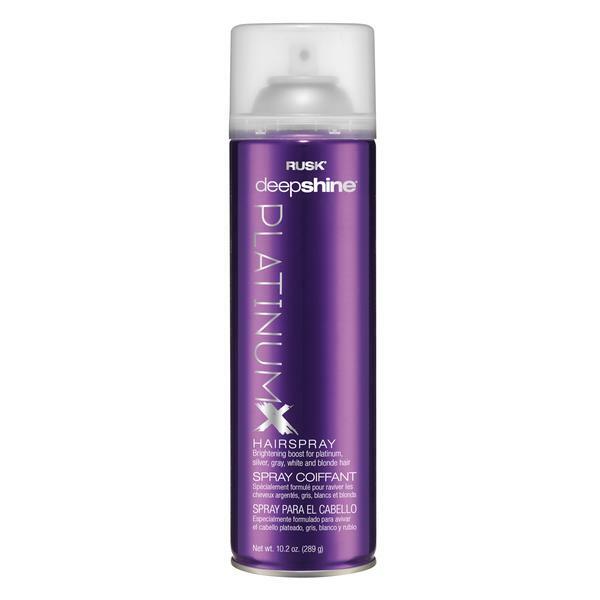 Achieve lustrous shine and retain moisture with PlatinumX fast-drying finishing spray. This non-stick, all- day, humidity-resistant spray for platinum, blonde, gray and silver hair provides strong hold, shape and body. Vitamin E helps create lustrous shine and untangled look. What is it? Rusk Deepshine PlatinumX Hairspray is a non-stick, fast-drying finishing spray. How do you use it? Shake well before using. Hold can upright 8?12 inches from hair. Spray evenly. Repeat for maximum hold.